New Year’s Eve is a unique holiday in that it is observed almost everywhere in the world. But many people honor the year-end in different ways. The Danish celebrate by smashing fine china on a friend’s front door. In Scotland, celebrations include the world-famous Hogmanay festival of a street party, concerts, processions and more. In the U.S., if there’s one thing that’s certain about New Year’s Eve, it’s that Americans are going to go out, and they are definitely going to let loose. WalletHub put together some fascinating NYE statistics, breaking down the revelry into facts and figures, starting with where New Year’s falls on the scale of America’s favorite holidays: Quite surprisingly, Christmas, Thanksgiving and the Fourth of July all top NYE. The good news: Less than half of all Americans (49 percent) plan to stay home, so that means a lot of people will be out and about. While some may splurge on a celebration, a vast majority will not. Eighty-three percent of Americans say that they will spend less than $200 on NYE celebrations. Of the 51 percent of people who are presumably going out on New Year’s, just 18 percent are heading to a friend’s house. Nine percent plan to be at a bar, a restaurant or an organized event for New Year’s Eve while 23 percent don’t plan to celebrate the event at all. A staggering 103 million people will travel at least 30 miles from home for a New Year’s Eve event. Nearly 94 million will drive to their destination. More than 6 million people will fly to their New Year’s location (with an average roundtrip flight costing $204), and more than 3.5 million people will use other modes of transport on New Year’s such as cruising, taking the train or traveling by bus. For those spending NYE in NYC, they will be one of 2 million in attendance for the ball drop. Party passes will cost $229, and there will be more than seven thousand police officers protecting the event. 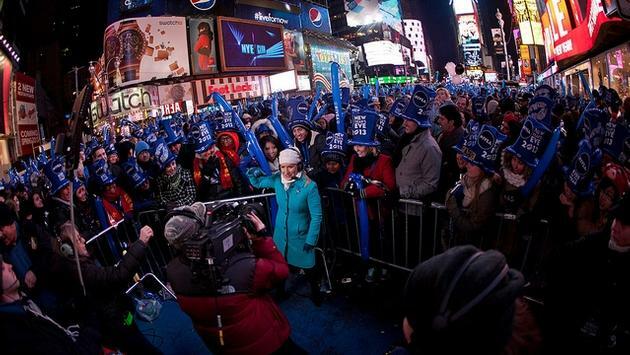 The dropping of the ball in New York City is by far the most well-known New Year's Eve tradition in the U.S. The first time the event took place was in 1907, and there have only been two times that the ball has not dropped: 1942 and 1943. When the ball does drop this year, it will unload 1.5 tons of confetti onto revelers that will be picked up by approximately 280 sanitation workers the following day. New Year’s Day has its own traditions. While revelers on the East Coast are recovering from their night in Times Square, West Coasters are wheeling out flower-covered floats for the annual Tournament of Roses Parade in Pasadena, California. Acknowledging New Year’s traditions wouldn’t be complete without a nod to the most important one: resolutions. Sixty-seven percent of American’s will make resolutions, though just 9.2 percent are successful in achieving them.